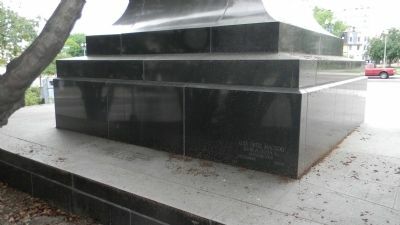 Erected 1968 by Government of Mexico. 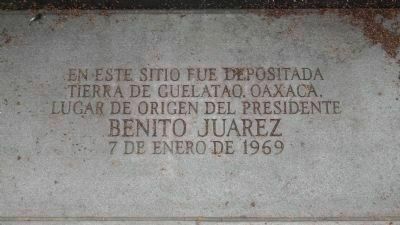 Translation: "On this site was deposited earth from Guelatao, Oaxaca, the birthplace of President Benito Juarez, January 7, 1969." 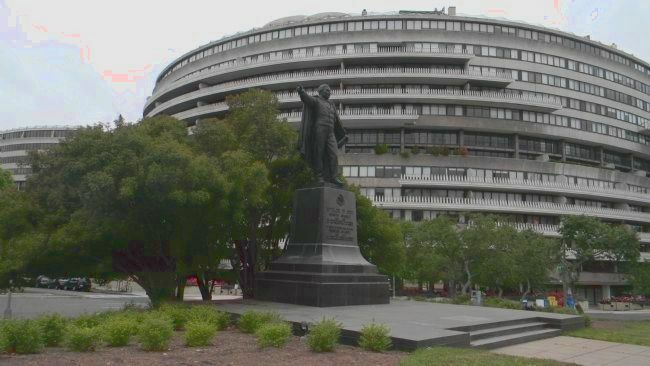 Watergate Complex, in the park constructed above the I-66 Freeway and within the traffic circle that also includes New Hampshire Avenue, NW. Marker is in this post office area: Washington DC 20037, United States of America. Touch for directions. Other nearby markers. At least 8 other markers are within walking distance of this marker. The Watergate Hotel (about 500 feet away, measured in a direct line); The American Meridian (about 700 feet away); Philip S. Amsterdam Hall (about 800 feet away); Site of 2310 H Street, Northwest (approx. 0.2 miles away); St. Mary’s Episcopal Church (approx. 0.2 miles away); Carol Brown Goldberg (approx. 0.2 miles away); A Canal to the West - Tide Lock (approx. 0.2 miles away); John A. Wilson, D.P.S. '92 (approx. 0.2 miles away). Touch for a list and map of all markers in Foggy Bottom. Additional keywords. 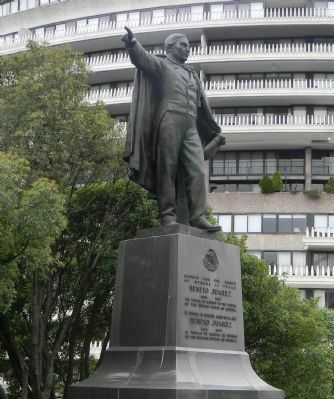 Enrique Alciati, sculptor; "Pablo Benito Juárez Monument and Park"; "Builder of Modern Mexico"; Luis Sosa Villasenor; National Park Service; Statues of the Liberators. 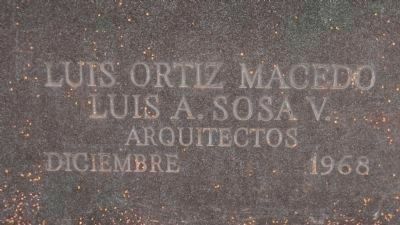 Luis Ortiz Macedo and Luis A. Sosa, V., architects. December 1968. More. 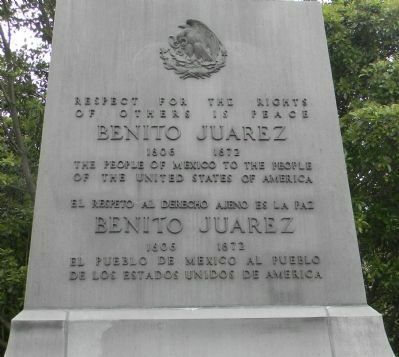 Search the internet for Benito Juárez Memorial. Credits. This page was last revised on June 16, 2016. This page originally submitted on June 5, 2013, by Richard E. Miller of Oxon Hill, Maryland. This page has been viewed 510 times since then and 9 times this year. Last updated on May 4, 2015, by J. Makali Bruton of Querétaro, Mexico. Photos: 1, 2, 3, 4, 5, 6. submitted on June 5, 2013, by Richard E. Miller of Oxon Hill, Maryland. • Bill Pfingsten was the editor who published this page.